This is my recipe for a spicy 7 bean chili. This is a very hearty meat and veggie filled home cooked meal. You can make this recipe as spicy as you would like to. I love chili and have tried so many different recipes out of cookbooks and never really found one I liked. 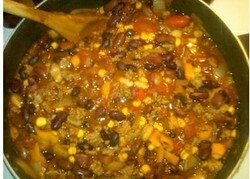 I found that a lot of recipes for chili are based solely on meat, but my recipe focuses more around the use of beans. Beans are great for your health. They are high in fiber and antioxidants. They are also a great source of protein. Not to mention they just taste great. With this recipe you can use these ingredients exactly or put your own spin on it. To prep, get all ingredients out and have bowls ready. Wash all of the vegetables before cutting anything to ensure all possible pesticides are removed. Next drain the can of corn, and drain all 7 cans of beans as well. You can begin by browning the ground beef* in a pan and draining the grease out of the meat into a separate bowl. While the meat is browning you can dice up your fresh vegetables. Dice 1 onion, 2 bell peppers of any color, and 1 whole tomato, then set aside. Mix all of the dry spices in a small mixing bowl and add 1tbsp of the drained grease and 1/2 cup of hot water to make more of a stock with the spices. Pour the stock and the beef into a 7 quart crockpot that has been set to low. Add the diced veggies to the crockpot as well. Next add 1 can of diced tomatoes and 1-6 oz can of tomato paste, 1 can of whole kernel corn(drained) and all 7 cans of beans(drained) into the mix. One shot of Jack Daniels whiskey if you so desire. ** Stir everything together well and let simmer in the crockpot. Everything should cook down and become a bit more soupy. If it isn't soupy enough for you, you can add a cup of water. I wouldn't add too much water to it because it will become runny. I usually let it cook for 5.5 hours on medium and .5 hours on high. Stir it every hour or so to make sure the spices mix in well. *Substitute ground turkey or ground chicken for lower fat content. **Whiskey is not an essential ingredient, it is just an add in that gives it another layer of flavor. If you desire a spicier chili add chili powder to your specific taste.